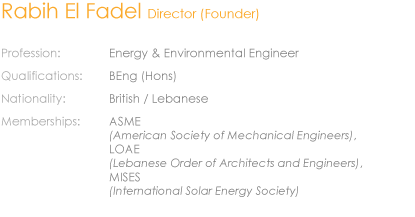 Rabih El Fadel (* 1964) has a unique understanding of sustainability, with over 13 years	experience in	Low	energy	designs,	Low- carbon	emission	initiatives,	including	energy	buildings	passive	design,	efficient	systems,	renewable energy, building management system	calculation	methodology. 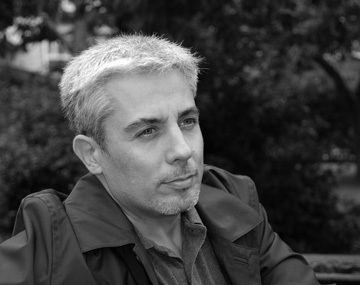 Rabih’s	24	years	experience	encompasses	project	design	and	development,	technical	implementation and management Environmental Design, sustainability framework (Energy, Water, Waste, Internal environmental quality, renewable energy, solar passive design) for	projects	in	Europe,	Middle-East,	USA	and	Africa. > Formulated sustainability framework development plans for masterplans, buildings,	industries municipalities. > Low	energy	and	sustainable	Project	Design Development. > Vast	experience	on	projects	across	a number	of	continents:	able	to	display ethical	equality,	sensitivity	and	adaptability. > Has	been	actively	involved	in	past	and current	projects	to	develop	and	improve the quality of life within the built environment. This	is	shown	through	a spectrum	of	projects. > Extensive knowledge of building regulations and	codes	for	a	number	of	countries.